Between an exhausting workweek and the return of cube to Magic Online, I didn’t have a ton of time for drafting this week, but I did manage to put together a couple decks. I somehow don’t have a shot of the final deck, but I did take screens of most of the picks, so I’ll walk through things. I opened a pretty easy first pick, where the only reasonable cards were Vainglory Patrol and Frenzied Omnivore. The Omnivore is a much stronger card, so this was an easy choice. My second pick put me to a choice immediately, by offering a choice between Grenadin Bellower, Reinvigorate, and Into the Furnace. Combrei has some very strong cards, but it isn’t directly supported by Set 3 synergies, or in Set 2. If you get lucky enough to get a bunch of Awakened Students out of Set 1, it’s great, but I don’t like committing to it yet. Grenadin Bellower is great, but not at its best if I wind up in Xenan, since it’s more of a go-tall deck instead of go-wide like Stonescar would be. Into the Furnace is a very versatile little spell after the buff to Fast, and I haven’t drafted Praxis in a while. Third pick, I had a choice between Disassembler, Seasoned Spelunker, and another Into the Furnace. I like Omnivore more than Into the Furnace, so I was more inclined to commit to Time. Seasoned Spelunker is quite a bit stronger after the buff, so I took him and moved in on Time. My next few picks were pretty unexciting, though I snagged a 6th-pick Stonescar Sawed-Off, which is a great way to push through damage. Oni Cavediver 9th pick showed me that Fire was pretty open. I opened trash in pack 2, with a pair of Justice cards and an Argenport Banner as the only things I’d ever consider playing. 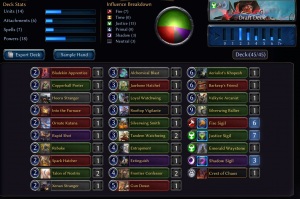 I raredrafted. Noble Firemane was the follow-up, a card that’s still quite powerful but less so now that Praxis is more concerned with going big instead of wide. Waystone Infuser made an appearance third pick, which is both a huge benefit and a nice signal that Time is open. It looks pretty innocuous as a 5-power 2/6, but it’s one of the best cards in the set. Drawing yourself through your power pockets later in the game is a major advantage, and it blocks well and has warp itself. I picked up Amber Ring next, which is not a very good card in most cases, but the Praxis deck wants both relics and explorers. If I get there on payoffs, it can certainly make the deck. Pack 3, I got punished for not being Combrei, as I opened both Awakened Student and Paladin Oathbook. Pack 3 was pretty thin for me. I picked up a Pyroknight and a splashable Smuggler’s Stash, along with a Stonescar Stranger, so it wasn’t all bad. Pack 4, I opened a very slim pack that contained Monolith Guardian and Recycler as the only two reasonable cards for me. I didn’t have enough relics to make Guardian good, so I took the Recycler in case I needed a splash, though I hoped not. Splashing started to look like it was happening, as I followed up with Extinguish from another pack containing no Praxis cards. I picked up some Trail Makers late in the pack, so I wound up splashing the Smuggler’s Stash and Recycler, along with Extinguish. Recycler was a little suspect, but I needed a final playable, and he has a pretty high upside if you can get there on the factions. I had plenty of fixing, and it didn’t turn out to be a problem. I wound up 5-3 with this deck, but should have been at 6+ if not for a massive punt in the final game. I had a Dormant Sentinel wearing Stonescar Sawed-off, along with a Waystone Infuser wielding a Fixit from Recycler. My opponent had some favorable blocks that would put them at 1, or some unfavorable blocks that would put them at 3. I had drawn Baying Serasaur and played a power off the top so my Sentinel had Overwhelm. I figured they might take the good blocks and go to 1, then I’d get ’em with Serasaur for the last point off Nightfall. I spaced out and forgot they were Justice. My Sentinel ate an Entrapment that I easily could have prevented by playing Serasaur before attacks and making Nightfall. It’s something I definitely should have seen. Even though playing out Serasaur would make it so that I didn’t win that turn, they would have had to make some bad blocks that meant that their outs were very slim. Instead, they made good blocks, killed most of my threats, and then killed me. Ah well, lessons learned. It took a lot of discipline to share this one. Frankly, I don’t know where it went off the rails. I started off on Duskwalker and Extinguish. Fine Xenan start. That dried up very quickly, and I was getting some late Valkyrie love, so I moved in on Justice and also picked up some late Fire cards. After pack 1, I had no damn idea what was happening. Pack 2, I opened Plated Goliath and Gun Down. These are on a similar power level, in my opinion, but Gun Down is more easily splashed if I wind up there, so I took that. I regretted it, as I got passed another Goliath, but I settled with a Xenan Stranger instead, intending to draft some sort of FJS pile. More regret followed as I got a Blistersting Wasp next. Because playables are thin in this draft format, I had some discipline and took a Talon of Nostrix. The time for waffling on factions was over. Maybe I should have been Xenan, but after pick 2 in pack 1, I saw nothing in those factions. I picked up a late Mortar over nothing, then opened another bad pack 3. I took a Shimmerpack and consigned this draft to oblivion. Pack 4 was pretty kind, giving me a Crest of Chaos, Valkyrie Arcanist, and Rooftop Vigilante. I considered splashing the Mortar as well as a Jarrall’s Frostkin that I picked up in Pack 3, but despite a Hooru Stranger, I didn’t really have any other way to get Primal influence. I wound up with some pretty mediocre cards at the top-end as my final playables. I didn’t have high hopes for the deck, but maybe I’d freeroll a few power-screwed opponents. Truthfully, 3-3 was above my expectations. Silverwing Rallier was as atrocious as I always suspected it was. Most of my Valkyries (and most Valkyries in general) were pretty small, meaning this guy cost 7+ most of the time. And even if you manage to play him, he doesn’t stabilize the board. For his cost, he doesn’t block well (and you exhausted a blocker to play him! ), and if you’re behind on life, 5 damage doesn’t race that well without lifesteal or endurance. This was the first time I’d ever tried it in the deck, and it’ll take something special to make me do it again. Final Tally: 8-6 (56-34 overall). Not a great week, but it’s early in the season and that’s okay. It was pretty frustrating because I don’t feel like I made too many mistakes in drafting, especially in the second draft. This format pressures you to commit hard, but when signals get crossed or playables simply dry up, it’s difficult to stay the course. And even when I did commit, correctly both from my perspective at the time, and from how the packs actually played out, I still wound up very short on good playables. Weak packs, and even weak drafts happen sometimes. Eternal only has 8 commons per pack, but when so many commons are wildly unplayable, sometimes you just roll packs with nothing good in them. Personally I don’t like that design choice, but that’s what we’ve got, and we have to make the best of it, even if it results in a miserable deck from time to time. Card of the Week goes to Entrapment. Play around this thing, people! Even if it got nerfed. Magic Weekly Draft Report – Merry Cubemas!